Welcome to the first week of the New Year, 2019. 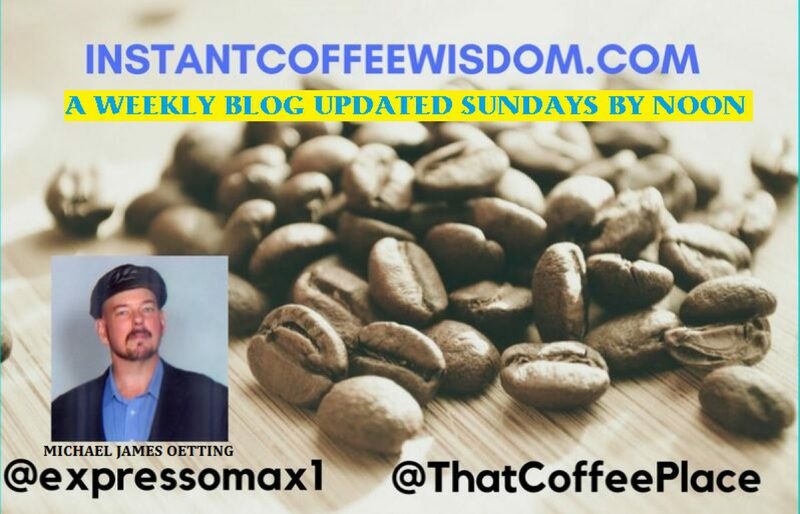 There was no blog post last week for the first time since the inception of http://www.InstantCoffeeWisdom.com back in September of 2017. I felt it was appropriate to schedule a break over the Christmas/New Year’s holiday period. Today is Sunday, January 6th. Some Christians still refer to this day as Epiphany, or the Twelfth-Day, commemorating the manifestation of Christ to the gentiles in the persons of the Magi. In a few countries around the world, it is almost as big a celebration as Christmas Day itself. Here in the USA, not so much. Epiphany spelled with a lowercase ‘e’ is also a word to describe a sudden, intuitive perception of or insight into the reality or essential meaning of something, usually initiated by some simple, homely, or commonplace occurrence or experience. There is nothing more commonplace then the annual changing of the calendar, and the start of the new year. It is a do-over, a time for new beginning and a fresh start as we lay the past to rest. For the past twenty years in the USA, the cable TV SYFY channel (originally called Sci-Fi) has celebrated New Year’s Eve by broadcasting a Twilight Zone marathon. This classic television program from October 2, 1959 through June 19, 1964 depicted weekly tales of bizarre, supernatural occurrences and the effects of such on an ever-changing cast of characters. The show has been revived several times and a new version is in the works. The title of the show is so recognizable that it has become a colloquial term to describe any bizarre or ludicrous situation or behavior that rears its ugly head to cause chaos or havoc. Sometimes things really do happen which are beyond our control. But only sometimes. Often we bring these unfortunate things upon our on heads due to poor planning, stupidity, and/or laziness. No one ever promised that life would be easy, or fair, but it is worth it, and there are countless opportunities to reset the clock, and begin anew. The key is both to learn from our mistakes and to not quit. Quitters never win, and winners never quit. Perception is the lens which defines our reality. Are things really as bad as we ‘think’ they are? Or do we make our situations far worse by convincing ourselves as we bemoan our circumstances? One surefire way to determine progress is to diligently keep track of the pertinent data, and recording your findings on a regular schedule, then track the records by journals or charts. As negative trends emerge, you will become aware of them early on and be able to correct the course before you sail into dangerous waters. As this is still just the first week of the new year, there is still time to run out and buy a calendar/planner book for you to chart your progress throughout the new year. I do this religiously every year, and have been doing so for most of my adult life. Keeping records and tracking progress has been instrumental in keeping a positive outlook, and propelled me further on the path of success, keeping miles ahead of The Marching Morons. There are many people in media who keep informing us about how terrible the US financial markets were in 2018, and how 2018 was the worst year for the market in eleven years, and that is was the worst December since The Great Depression of 1931. Yes, I too reported a SLIGHT loss in my net-worth for 2018. (4.7%) If I offset my loss by my gains of the last decade, it is nearly non-existent, a mere pittance. So tell me Great Kreskin, what does 2018 predict for 2019? Only a fool would bet against the mighty economy of this country. The elephant is the largest animal on land. There’s an old saying. ‘How do you eat an elephant?’ The answer is ‘One bite at a time’ . Sometime we have grand ambitions and lofty goals. The key to accomplishing these lay in proper planning and by breaking down the larger parts of the goal into smaller, more manageable sub-goals. The original task in its entirety may seem overwhelming, but by breaking it down into smaller, more manageable jobs, you can slowly accomplish the big picture, while bolstered by noticeable progress as you tick-off boxes on your to-do list. Again, as this is THE FIRST WEEK OF 2019, There is still time to plan out your goals and sub-goals by week, month, and quarter. You have an entire new year to improve various aspects of your life. Some goals can be worked on simultaneously, as they may complement one another if done in tandem. One example of tandem goals is the two-fold goal of eating healthier, and exercising. Both work best when done together. When you complete your goals, mark then down. Successful people work from lists and write things down! Don’t be afraid to start small, Rome wasn’t built in a day. The most important part is to START. Just keep your goals clear and measurable, and write them down. Set reminders on your phone or calendar planner book. Enlist the help of friends as ‘accountability buddies’ if you need to. Begin at the beginning, and repeat to completion! You got this in the bag! We were all newbies once, so we’ve all experienced the uncertainty of where to begin. Here’s a few self-improvement suggestions for helping to jog your journey to a ‘new and improved’ you. Eat a cup of veggies at lunch and dinner. Get 30 minutes of ‘ME-TIME’ every day. Read one chapter of a book 3 times a week. Start today, and before you know it, you’ll have developed good habits that will eventually add up to a fresh new you! As always I wish you success and happiness! Author instantcoffeewisdomPosted on January 6, 2019 January 7, 2019 Tags Advice, Bible, business, economics, finance, friends, God, happiness, Health, Jesus, money, religion, security, self improvement, success, USA, workLeave a comment on Time for a do-over? Don’t Lose Those ‘Kodak’ Moments! Louis Daguerre produced the first daguerreotype (an early photo process) when he shot an image of the Boulevard du Temple, Paris in 1838. Film cameras didn’t develop until 1888 when Kodak invented his film process. In 1900, the $1.00 Kodak Brownie camera was introduced, and modern photography was born. For most of the twentieth century, photography was pretty much the same. Cameras may have varied from company to company, some boasting better optics, wider shutter length settings, or built in eclectic flashes, but they all used film. Eastman Kodak pretty much dominated the market, but some swore Fuji Film was more vivid. The drawback of film is that you had to send it out to be developed at a film lab, and then wait for the prints to arrive in the mail, or at the FotoMat booth, or the drugstore. If you were willing to invent in a home dark room, and the chemicals needed, you could do it yourself, but most folks were content to leave it to the professionals. The only other alternative was the Polaroid instant camera. Like the early daguerreotype, the Polaroid process produced an instant print that was one of a kind, it had no negative, the print WAS the print, the only existing copy. If you wanted to copy a Polaroid photo, you needed to have the original photographed with a film camera, and of course there was slight loss of quality as this was a copy of a copy. Today, more pictures are shot in a single year than in all of the last century. Each year over a trillion pictures are taken thanks to smart phones with built-in cameras. I have maybe five photographs of my father. My mother didn’t take pictures, she was never a photo bug. There were a few years when she arranged for a professional photographer to come to the house for baby pictures to be taken, or family portraits, but she couldn’t be bothered to buy a simple camera. The few pictures she horded were given her by family and friends, but most of those were lost as we moved like gypsies after she lost her second husband, my stepfather. After my stepfather Alfred died, my mother had a boyfriend named Bill. In reality, this was a teenage crush that she bumped into many years down the road. He was a shutter bug, and owned a Polaroid Instamatic Camera. That was the first camera I ever used. Years later, when I was about 12, my aunt Arleen gave me a Kodak Instamatic. Essentially Kodak had copied the Polaroid Instant Camera and were sued into dropping the new clone from their production line. You were able to buy the film for it for a little while, but eventually it was totally obsolete after the film stock expired and new film wasn’t manufactured. My second job was working for Olden Camera in NYC, in their computer department. It was then that I purchased my first real 35mm camera, a Nikkon automatic. This point and shot camera was pretty simple to use and lasted many years. Eventually I did get a ‘real’ camera, a Minolta SLR with various lenses and accessories. It was a lot of weight lugging about that loaded camera bag of accessories, and it was annoying trying to explain all the settings and how to use the camera when I passed it to someone to shoot if the self-timer function was impractical and I wanted to be in the picture. Then disposable cameras came about, and I started using those as everyone knew how to work them. The point is, from the time I brought my Nikkon in the 80’s, for nearly twenty years I shot 35mm film. I have boxes of negative files, and envelopes of prints, as well as photo albums. For almost the first thirty years of my life, you were limited to film cameras, and the most you could shoot on a roll was 36 exposures. So when you went somewhere and saw something that you wanted to remember forever, you selectively shot one or two photos of it at most, because you had limited shots, and buying film, and getting it processed and printed was expensive. Nowadays, most of what we shoot is digital, and we send the pictures we want to share in e-mail or texts. The sizes of the digital storage media has even changed, with most of the early media obsolete. Yet, because the photos are digital we are taking more pictures than ever because smart phones have built in cameras that are getting better with each new model. You still take better pictures with a dedicated digital camera than you do with a smart phone, but even I will use my phone to take pictures if it’s all I have on me. Pictures have value. We prize them and treasure them. A couple of years ago, I lost a SD card with pictures that were not yet copied to my hard drive. I was packing to return from a trip to the shore, and I think I left it on a table at the hotel. It was never recovered. If you use a digital camera like I do, back it up frequently if not after every photo shoot. Even if you use your phone to take pictures, copy the data. Theoretically, smart phones back-up their data to the cloud, but I still don’t trust that. This is why it is vitally important to frequently back-up and copy all your image files. If your electronics suffer a catastrophe, you don’t want to compound the blow by losing your precious ‘Kodak’ moments. Pictures, or it ‘never happened’! Organize your old prints and negatives. A few weeks ago, I was searching for some old vacation photos from 16 years ago, I needed an image, and I could not find either the prints or the negatives. It was very frustrating. It’s probably packed away in a box somewhere in the bottom of the walk-in, but damned if I know where. Frequently copy your media cards. If you have obsolete media, copy the data off the cards while you still have an appropriate reader. Media is useless if you can’t access it. if you have old Polaroid’s or prints, scan them into a digital file. If you have old negatives, invest in a good quality negative scanner and digitize them. The time, money, and effort you put into preserving your treasured photos will be returned when you can locate and share your Kodak moments. As Always I wish you success and happiness! Author instantcoffeewisdomPosted on August 26, 2018 August 26, 2018 Tags crafts, digital, film, friends, hobbies, money, photo, photography, pictures, security, self improvement, success, travelLeave a comment on Say Cheese! Even a penny is a treasure! One of my earliest memories of my father involved him giving me a small metal treasure chest filled with old coins. In actuality, this was a just a metal coin bank, but unlike the usually piggy bank shape, this one was shaped like a stereotypical pirate chest one might see in an old movie, or in an illustration from a book on pirates. Although I was quite young at the time, I do remember three things about the incident. The first thing was that my father originally told me a tall tale about finding the treasure chest buried in the yard by pirates. Not quite the right thing to say to a young impressionable boy with a vivid imagination. My first impulse was to grab a shovel and start trying to dig up the yard in search of more buried pirate booty. Upon realizing his mistake, retrieving the shovel and re-filling the holes in the back yard, my father confessed to making up the whimsical pirate story in jest to have a bit of fun at my expense. A kid will believe anything, they’re too young to know any better. After a long explanation that pirates like Long John Silver and Blackbeard were not part of the modern world, the second thing I remember was being delighted that the coins all looked different from contemporary money. I was old enough to know the difference between pennies, nickels, dimes, dimes, quarters, half-dollar, and dollar coins. A lot of the coins were from the 1800’s. This was my father’s coin collection, and he wanted me to have it to encourage an interest in both saving and collecting money. This is something which has stuck with me my whole life. A year or so later, my father died suddenly as a result of kidney failure. The third thing I remember about the treasure chest of coins was that sometime after the death of first my father, and then my step father, my mother sold the coins to a dealer without my knowledge. It’s not like I looked at them every day, and we had to move quite a bit after she sold the house. Things ‘out of sight’ were always said to be ‘packed away in storage’ until I forgot about them. My mother only understood two things about money, she could spend it, and she never had as much as she’d like. The origin of the piggy bank is disputed by different sources. Some say that early coin jars in the middle ages were made of a type of clay called pygg. This word sounded like pig, and an English potter mistakenly created a pig-shaped bank when someone asked for a pygg money jar. There is little evidence to support this widely believed myth. What is known is that sometime about 1900, the first modern Piggy Banks were sold in the USA, and they cost 25¢. Billed as a new novelty, these early clay banks didn’t have the removable stopper on the bottom of the bank. If you wanted to remove the coins, you had to smash the bank, or kill the pig, so to speak. Even to this day, whenever I empty my coin jar and take a bunch of wrapped coins to the bank, I say to the back teller that I killed the piggy bank. I never quite understood the charm of a piggy bank, or of giving them to children to teach about saving. A coin jar works much better. It’s my humble opinion that parents who encouraged children to save money in piggy banks did so because young children have a nasty habit of putting everything they can grab into their mouth. By making a game of putting the penny in the piggy bank, it helped keep the coins out of the mouths of babes. Of course, I may be mistaken, but that’s the nature of opinions. The next time I became excited about coins and money was 1976, the USA bicentennial. There was a lot of hoopla concerning our great nation reaching its second century. Tall ships sailed into NYC, there were extra fireworks around the 4th of July, a lot of patriotic symbols on all kinds of novelties could be had. And the money changed. The quarters, half-dollars, and dollar coins all had a special bicentennial obverse and a double date. Likewise, after a ten year absence, $2 bills were reintroduced with a bicentennial themed back depicting the signing of the Declaration of Independence. I had never seen a $2 bill. My mother was very excited. That was when I suddenly remembered about the long-unseen treasure chest of coins, which I then asked for, only to be told that that was ‘lost in the move’. As a consolation, I was given several specimens of all the new bicentennial money, including several $2 bills. I’ve had a love of $2 bills ever since. I even have some Canadian $2 bills, both the obsolete paper money and the two loonie or toonie coin. Canada stopped printing $1 and $2 paper money back in 1986. Canadian dollar coins have a loon (a common Canadian waterfowl) on the obverse. They were nicknamed loonies. Some Canadians even started referring to piggy banks as loonie bins. In the late 1980’s Playtoy Industries of Toronto Canada manufactured a Giant Loonie Bank. Sadly, according to a recent news article, Canada says that currency which is no longer being printed will cease to be legal tender in the near future, and will become worthless paper. This takes us back to collecting coins and money in general. For the most part, money is the one collectible item that always retains its face value. The USA considers all US currency to be legal tender. If you take a 1937 ‘Mercury Dime’ to your bank, you can deposit it into your account as 10¢. Once a bank gets a hold of old money, it takes it out of circulation never to be seen again. If you took it to a coin collector instead, you’d get more than face value. The silver content alone is worth more than a dime. To collectors, the condition of the money and its rarity give added value beyond that of the face value. I save all kinds of old money. Some of it is for sentimental reasons, like my $2 bills. Others like my Indian Head pennies are rare. Some coins I have paid slightly above face value to get an entire set in ‘uncirculated’ condition. To collectors, uncirculated coins and collector proof sets command high value. The US Mint sells these collector proof sets for way above face value. The 2018 proof set has ten coins all bearing the ‘S’ mint mark from San Francisco with a frosted, sculptured foreground set against a mirror-like field. You get the five America the Beautiful Quarters, the Native American $1 coin, Kennedy Half-dollar, Roosevelt dime, Jefferson nickel, and Lincoln penny. Face value, it adds up to $2.91. The US Mint sells it for $27.95 +S/h. To me, it’s not worth the extra $25.04 for super-shiny, uncirculated coins. Some people buy these proof sets every year for their children and grandchildren. I’m not saying that they won’t increase in value among collectors, just that they only are worth face value if you spend them. I can’t tell you the exact number of times some teenager came in to the convenience store I worked at back in the day with a horde of old coins. In my mind, I just knew that someone had raided grandpa’s coin collection, but the money was legal tender, and I was simply speculating on how it was obtained. I would buy out the rare monies once they left, replacing the antiquities with contemporary counterparts from my wallet. I’m probably never going to cash in my coin and paper money collection, but it is a comfort to know that if something terrible were to happen, I could at least spend it for face value even if I couldn’t locate another interested collector willing to obtain the collection for a premium. Drowning in this well, oh can’t you tell? Well I’ve been face down and pushed aside. Cause I ain’t worth a dime. The reason I was born. By a woman who was kneeling down, looking for some change. Told them what was lost is found, it’s another penny saved. The 1987 movie Throw Mama From The Train stars Danny DeVito and Billy Chrystal as Owen and Larry. Middle-aged Owen lives at home with his overbearing mother. He seems like he might be a little slow. Larry is his writing teacher at the adult continuing education program he attends. There’s a scene that is genuinely emotionally touching when Owen wants to show Larry his coin collection. Larry doesn’t want to see the coins, but Owen makes him feel bad when he says he’s never shown them to anyone before. Owen slowly pulls out coins saying “This one is a nickel. And this is one is also a nickel. And here’s a quarter, and another quarter, and a penny.” Larry is annoyed at this, as the coins are all seemingly contemporary currency, and not worth anything more than face value. Owen then proceeds to explain how each coin is special to him because they were the change his Dad gave him during various father-son trips. It’s a collection of coins from change his dad gave him, and that’s where their value lies. Although the original coin collection my father gave to me is long gone, the special memory of the gift remains. Like any successful person who faces a setback, I started over, and in time I slowly began to amass a new collection of coins. As my financial situation improved, I started adding things like old paper money, silver certificates, foreign coins, uncirculated coins, you name it. At face value, my collection is worth thousands. To a collector, it’s worth even more. As far as I’m concerned, it’s priceless, and not for sale. Someday, I too hope to pass my collection to my son, when I finally have a son. Hopefully he will be able to keep it longer than I did my father’s. In either case, you can’t take it with you when you go, and a good man provides for his children, and his children’s children. Money is nice to have, but the memories we make with our loved ones are worth more than all the gold in Fort Knox. As always, I wish you success and happiness! Author instantcoffeewisdomPosted on August 19, 2018 August 18, 2018 Tags coins, collectibles, economy, finance, money, security, self improvement, success, USA, Wealth, wisdomLeave a comment on At Face Value! It’s The LEASED You Can Do! Just about anything can be rented or leased. If you’re going to do something infrequently, or only once, renting is better. We all have different skill sets, different wants, and different needs. Our circumstances and situations may have great impact on our choices, but we still have a choice. Growing up I wanted to get married, buy a house and have a family. None of these things happened. My reason for wanting a house was directly influenced by my desire to get married and have a family. I still can decide to buy a house if I really wanted to, but it doesn’t make sense to me in my current single lifestyle. Houses are liabilities. If you own a house, you are responsible for any and all maintenance or repairs that are needed to keep the house in good condition. So for quite some time now, I’ve been living in a rental apartment which I lease annually. The upkeep and maintenance are all included. When the water heater went out, the property manager replaced it. When the fridge died, I was given a new one. When the dryer stopped working, it was repaired. When the toilet was clogged last Saturday night, the super snaked it. As long as I pay my rent and don’t intentionally violate the terms of my lease living here is problem free. Plus I don’t have to mow a lawn or shovel snow in the winter. This past week, we’ve experienced heavy rains almost daily. This morning my co-worker told me he awoke to discover his basement was flooded. He’s got quite a mess to clean up and probable flood damage. I live on the third floor. I don’t have a basement to flood. In all the years that I’ve rented my apartment, had I been putting my money towards a mortgage on a house instead, I MIGHT have fully paid off the house by now, but every issue that happened to my apartment likewise, could have happened to my hypothetical house had I gone that route. I know people who have lost their houses because something serious happened and they couldn’t swing the upkeep, or they fell behind on their mortgage. Trust me, I made the right decision. My apartment is just the right size for all my stuff, and me. Two summer activities I enjoy are kayaking and jet skiing. A kayak retails for between $179 and $900+ depending on make and model. I go kayaking less than a dozen times a year, mostly during July and August. I COULD easily buy one. Instead, I usually rent then when I want one. The usual rental cost is about $40 for a two hour rental, which is about as long as I enjoy doing it for. The great part is that I don’t have to store it, or lug it around. When I’m done, I just return it. No problem. Yes, buying a kayak could pay for itself in two or three summers, but supposed it got damaged or needed to be replaced? It’s much more important to me to avoid the hassle. Peace of mind is priceless! A new Sea Doo Wave Runner Jet Ski runs between $5,500 and $15,000 depending on the model and accessories. I can rent one for $100 per hour. I may go jet skiing only once or twice each summer. I live over a hundred miles away from the coast. It makes no sense to me to spend that kind of money based up my current living situation. Just about anything you can buy can usually be rented. When I was best man at a friend’s wedding, I rented a tux for the day. Some women spend hundreds or even thousands of dollars for a wedding dress they will only ever wear ONCE. This never made sense to me. Just like a tux can be rented, some bridal boutiques do rent out wedding dresses. I don’t care how pretty the dress is, the important part of the wedding is the marriage, not the dress. If the point of getting married is to start a new life together, wouldn’t it be better to put that money to better use then to waste it on a dress for one day? The main points of conflict in relationships are financially based. Why would you sabotage a new life with a boatload of debt? Trust me on this ladies, debt-free is the new dowry. I avoid women with financial issues like I avoid the plague. If you can’t handle money, you couldn’t handle me. Just because anything under the sun can be rented doesn’t always mean you should rent it. I’ve never operated a back hoe, driven a bulldozer, operated a cherry-picker, or driven a truck larger than a two-ton delivery truck. If you don’t know what you are doing, you can seriously hurt yourself or wreck the equipment. Always make use that anything you rent either falls within your current skill set, or comes with instructions. I was nervous the first time I went kayaking. Before I ever got near the water, I was given basic instructions, helpful hints, and I asked a lot of questions. My first time jet skiing, I sat through a 30 minute class and took a boating safety test, followed by basic instructions and helpful hints. I also signed a liability sheet agreeing that should I fail to follow all the guidelines I would be accountable for any damage to the wave runner up to and including a full replacement of the vehicle. You CAN lease a new car instead of buying one, but in my case, leasing doesn’t make sense. I drive too far and too often, and car leases have mileage restrictions. I have to own my cars. Which brings us back to everyone being different. Only you can decide what is best for you. Sometimes a lease is better than buying, other times, not so much. Always read a lease agreement before you sign it because more often than not, breaking a lease has serious financial penalties. As always I wish you success and happiness! Author instantcoffeewisdomPosted on August 5, 2018 August 5, 2018 Tags cars, finance, happiness, money, security, success, USA, WealthLeave a comment on It’s The LEASED You Can Do!